Green auroras swirl across the night sky above the Arctic Circle, as seen from the 2019 Aurora | 360 flight. Watching the northern lights dance across the sky is a magical experience and one that will never lose its enchantment for me. However, predicting when and where to be for the best show on Earth can be a daunting task, as there are many factors that come into play, including solar activity and the weather on the ground. Fortunately, there is a way to take the guesswork out of aurora viewing — and have the time of your life in the process. In 2018, Consulta Meta, a Whitehorse-based company specializing in astrotourism experiences, launched a new experience called Aurora | 360. 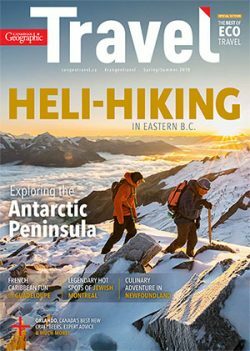 Offered once per winter, the program introduces visitors to some of the best outdoor and cultural activities on offer in the Whitehorse area. The highlight of the three-day itinerary? A chance to actually fly above the clouds and into the auroral oval (the ring of aurora borealis around the geomagnetic North Pole) on board a private chartered jet. So it is that on a frigid midnight last month, I boarded a Boeing 737 operated by Air North for the second annual Aurora | 360 flight. As we took to the sky, the plane was surrounded by millions of stars, the view unobstructed by clouds or city lights. Fifteen minutes into the flight, as we headed toward the auroral oval, we caught our first glimpse of a green ribbon of light on the left side of the plane. Over the next three hours, we were treated to a non-stop performance of northern lights, as well as warm cookies and celebratory gin cocktails courtesy of Yukon Brewing Company. The northern lights dance outside the windows of a Boeing 737 operated by Air North during the 2019 Aurora | 360 experience. The aurora flight was incredible, but back on Earth, I was about to discover why the Yukon is truly one of the top adventure destinations in Canada. Time and time again, locals told me they came for a year or two and haven’t left since, and it’s easy to see why: with seemingly endless pristine wilderness, the entire territory is an outdoor enthusiast’s playground. 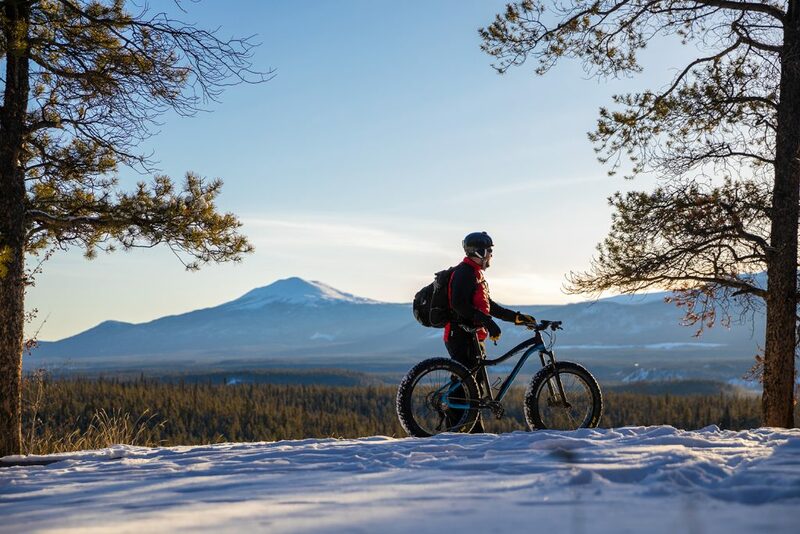 As part of the land-based portion of the Aurora | 360 experience, I joined Terra Riders on a guided fat bike adventure around Grey Mountain and saw for myself why people fall in love with this beautiful place. Fatbiking around Grey Mountain, near Whitehorse, Yukon. 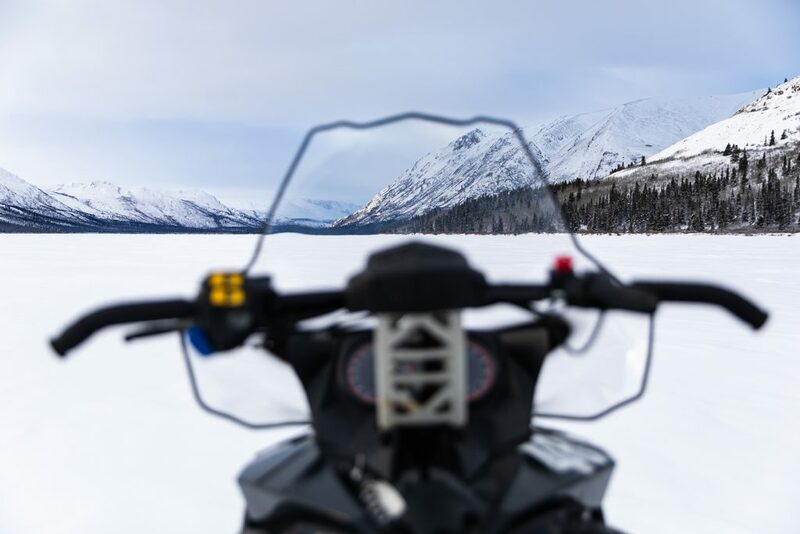 With such a vast landscape to explore, one of the best ways to get around in the winter is by snowmobile. This was my first time on a snowmobile, but I caught on quickly as we dashed across the frozen Fish Lake, located just 15 kilometres from Whitehorse, and made our way up to a viewpoint overlooking the mountainous landscape. 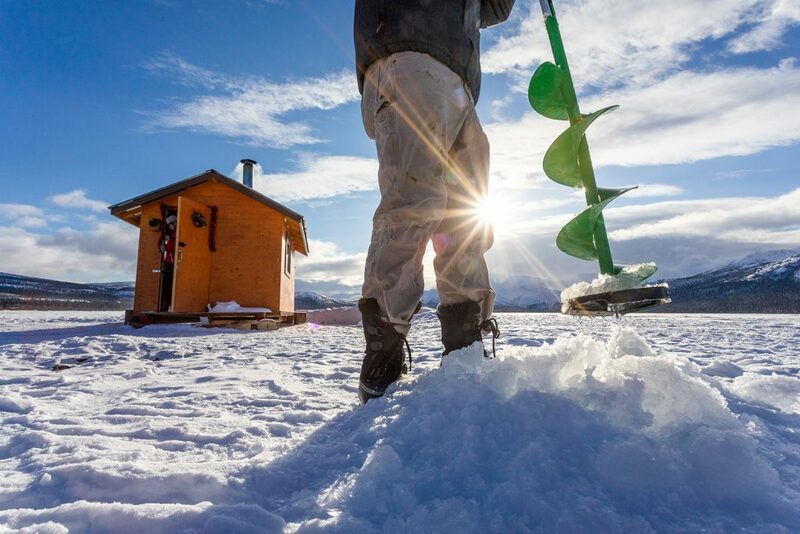 With warm hot chocolate in hand, I looked out at the tiny ice fishing huts scattered across the lake down below, where I would head a little later on. The best way to get around the Yukon in the winter? By snowmobile, of course. If walking is more your speed, you can slow things down and go at your own pace by strapping on a pair of snowshoes and heading into the snowy wilderness around Fish Lake. It’s a great way to take in the refreshing, quiet sounds and scenery of the mountain’s snow covered forests. 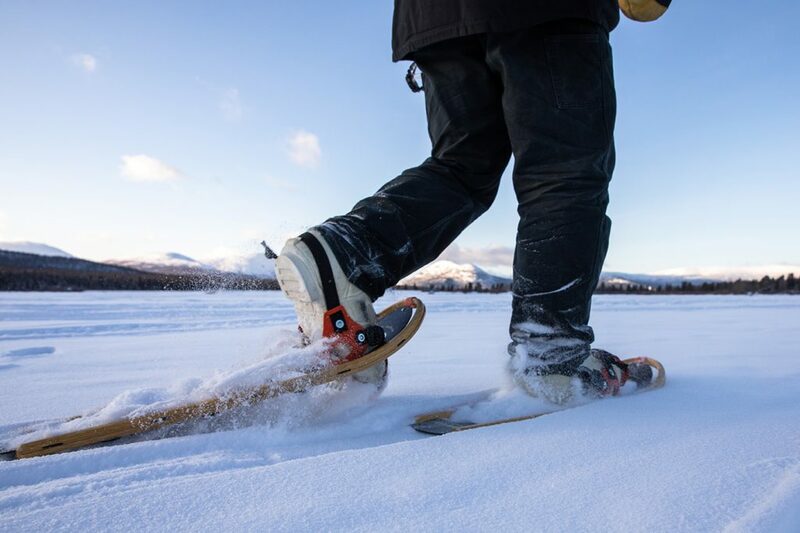 Enjoy the peace of the Yukon wilderness by strapping on a pair of snowshoes to explore. As the sun began to cast long shadows on the snow, I walked out on the ice to try my luck at catching a trout or Arctic grayling, with mountains surrounding me on every side. When the warmth of the sun had dissipated, we headed inside our little hut and welcomed the heat of the crackling wood stove. Try your hand at catching a trout or an arctic grayling on Fish Lake. With Whitehorse being situated in the traditional territory of the Kwanlin Dün First Nation, we had the honour of being welcomed into the Kwanlin Dün Cultural Centre to dine on traditional foods. 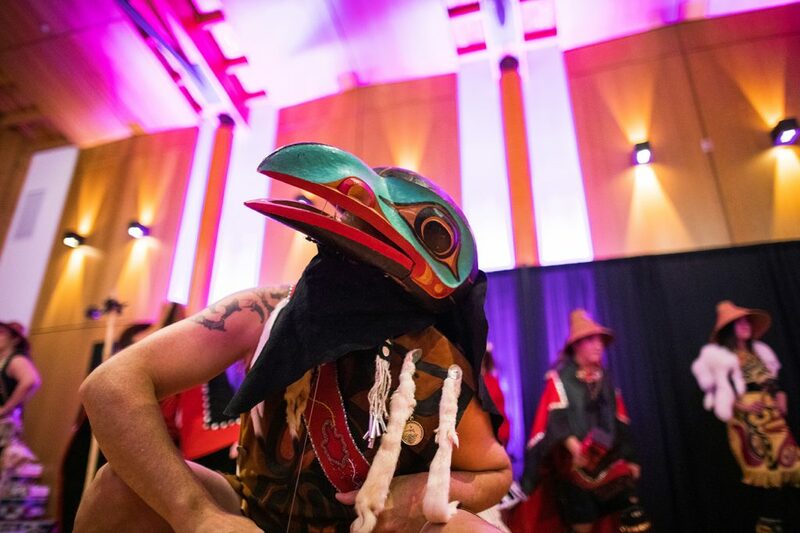 There, we also took in an exciting performance by the Whitehorse-based Dakhká Khwáan Dancers, an award-winning dance troupe that aims to reclaim the language and traditions of the Inland Tlingit peoples through dancing, drumming and storytelling. David Jensen, a member of the Dakhká Khwáan Dancers, performs a piece called Raven Strut at the Kwanlin Dün Cultural Centre in Whitehorse, Yukon. 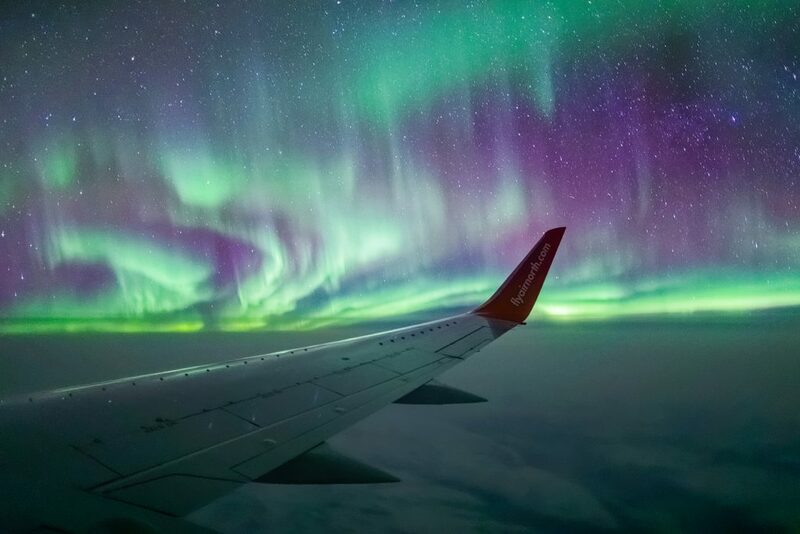 And of course, flying isn’t the only way to see the northern lights on this trip. You can head out of the city on your own or join a tour with Arctic Range Adventure to watch the aurora borealis on their property, away from the city lights. Then, warm up around a cozy fire in one of their teepees. 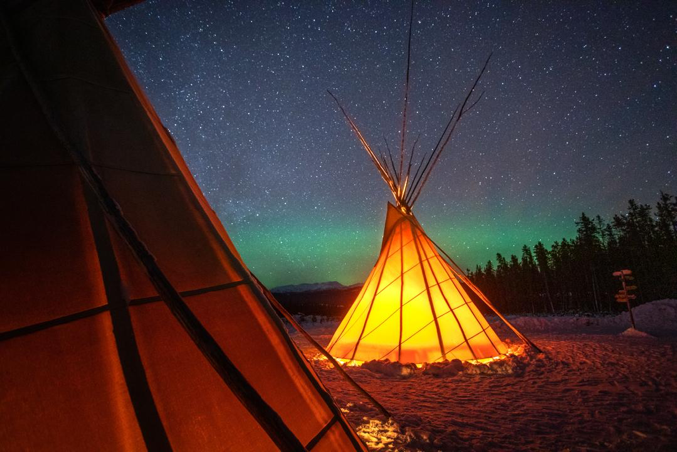 Northern lights and star viewing are better when you can pop into a teepee to warm up from time to time. We spent the last day of our tour at the Yukon Wildlife Preserve, where 283 hectares of natural habitat offers opportunities to view assorted northern Canadian mammals such as lynx, Arctic fox, mountain goats and muskox. As the sun set, we gathered at a lodge for a barbecue catered by a local chef. 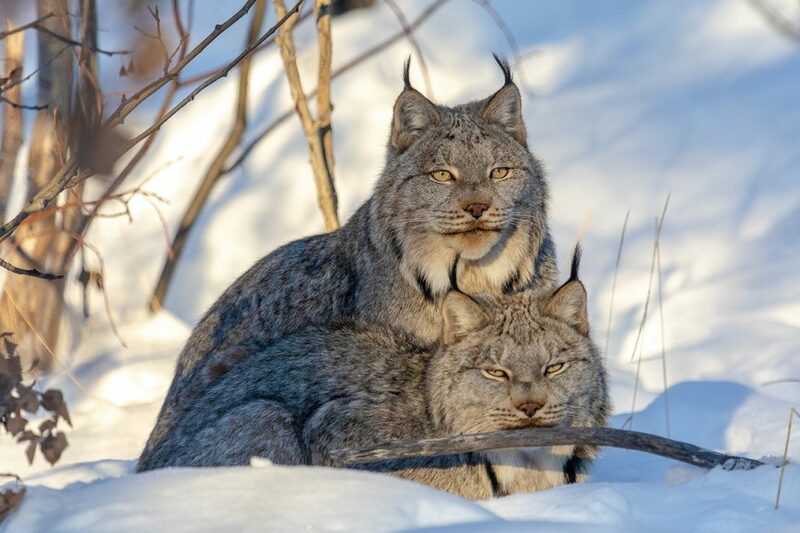 The Yukon Wildlife Preserve offers opportunities to view iconic northern wildlife, including Canada lynx, pictured. 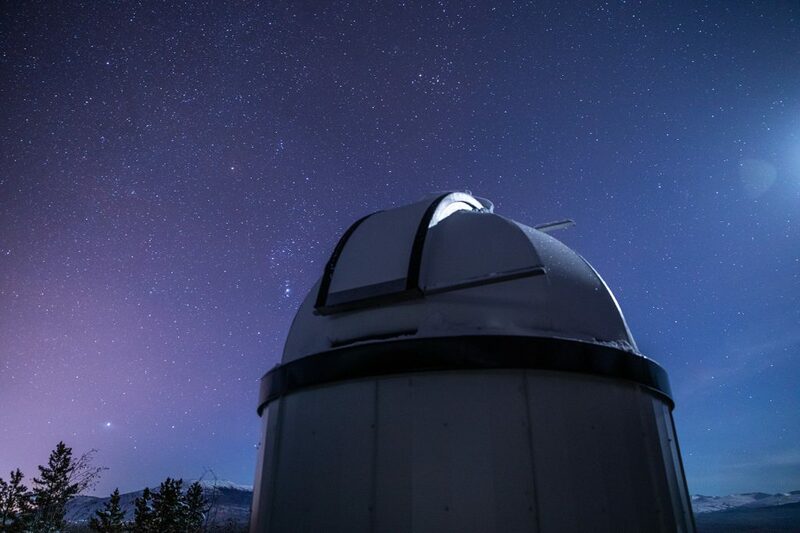 Since we spent so much of our time in the Yukon looking at the night sky, our tour wouldn’t have been complete without a visit to the Yukon Astronomical Society’s brand new observatory. Opened to the public in late 2018, the site includes a dome housing an 11-inch diameter Schmidt-Cassegrain telescope to help visitors get a closer look at what lies beyond our blue planet. The new observatory of the Yukon Astronomical Society. Basking in the warmth of the natural Takhini Hot Springs is a refreshing way to end your trip and reflect on all you’ve seen and done over the past few days. If it’s cold enough outside, try out a new hairstyle by sculpting your frozen hair into creative shapes, then snap a pic and enter it in the Hot Springs’ annual hair freezing contest. 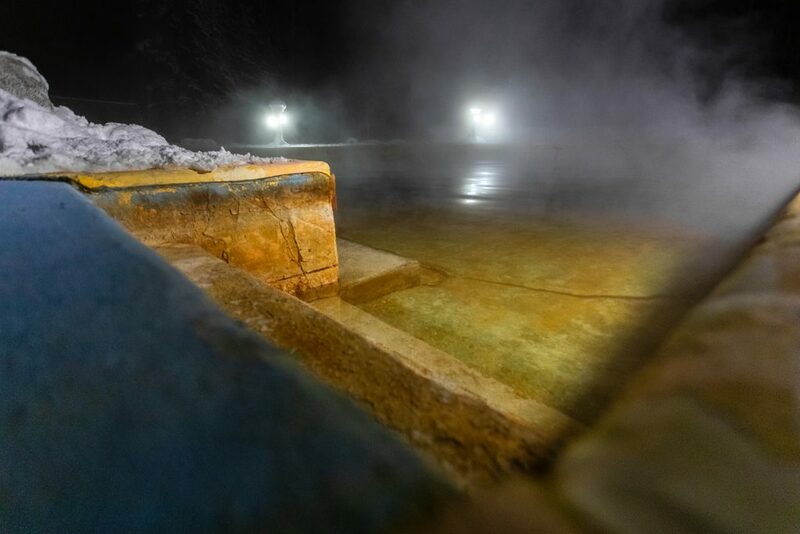 The natural Takhini Hot Springs are a great place to soak after a day of adventuring — and try out a crazy new hairstyle. Dates and details for the 2020 Aurora | 360 experience will be revealed soon. Visit the Aurora | 360 website for more information.